Methi sprouts are a healthy addition to your diet. After my alloo methi sprouts stir fry recipe, I followed Balvinder Kaur's idea of using fenugreek sprouts with pumpkin. 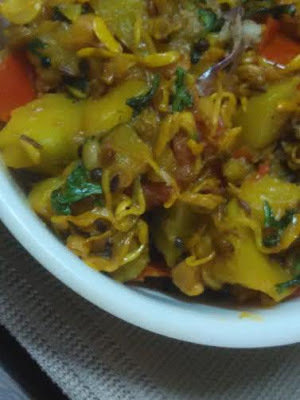 It was such a delicious recipe that I have fallen in love with methi sprouts and keenly look for different combinations. Cut pumpkin into small pieces. Take oil in a nonstick pan. Next add pumpkin pieces and methi sprouts. Add salt, haldi, red chilly powder, and tomato pieces. Cook & cover. Keep on a low flame. Your kaddu methi sprouts stir fry is ready!